On the 350 acres they farm in Vineland, N.J., Richard Marolda Sr. and his son, Richard Jr., grow 30 different kinds of produce. They raise beets and bok choy, peppers and radishes, four varieties of lettuce and even dandelion greens. But when the Marolda's phone rang last year, the customer on the other end wanted just one thing: beefsteak tomatoes. "Lucky for us," Richard Jr. said, "we had what they wanted, and they wanted what we had." The caller was the Campbell Soup Company, located 31 miles north in Camden, and Campbell's didn't just want beefsteak tomatoes; it wanted every single beefsteak tomato on the property. The Maroldas combed their fields and found a thousand pounds of tomatoes. Campbell's bought it all. Up in Camden, a secret project was in the offing. 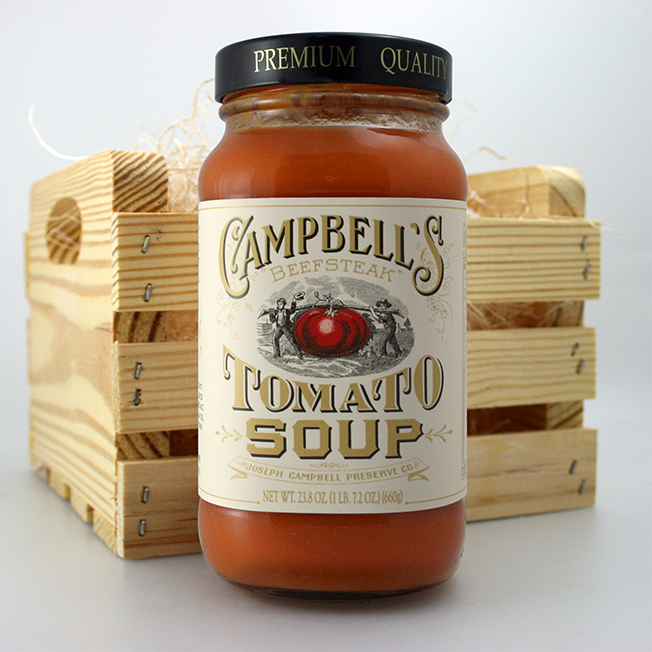 On a recent trip to the company vault, Campbell's R&D team had come across the original 1915 recipe for Beefsteak Tomato Soup, and decided to cook up a batch. "It was an internal challenge—just to see if we could do it," said Michelle Morale, director of marketing for Campbell's soup and broth division. After some trial and effort, the cooks triumphed, creating a few hundred jars of the vintage soup and then giving them away. (Scroll down to watch a video on this project.) But in the middle of all that stirring and seasoning, something unexpected happened. The project, Morale said, "tapped into the pride of our employees and created so much excitement that they said, 'Let's try to do this again.'" And so Campbell's is doing it again. Increasing the scope of the project (finding 20,000 pounds of beefsteak tomatoes at the Ed Wuillermin & Sons Farm in Hammonton, New Jersey) the 147-year-old brand recently cooked up another batch of its original-recipe tomato soup. This time it produced 10,000 jars, distributing them to select New Jersey and Pennsylvania Cracker Barrel restaurants, which is currently selling them in its gift shops. For Campbell's, the appeal of this cooking exercise lay not so much in revenue—even a truckload of soup won't move the needle much on a brand that pulls in $8 billion annually—but in heritage branding. The recipe in question is one developed by legendary company president John Dorrance, who invented condensed soup in 1897 and introduced beefsteak tomato soup in 1915 after one of his culinary tours of Europe. "This recipe," Morale said, "pays tribute to our past." And by using beefsteak tomatoes from local farmers, she added, Campbell's hopes to remind the public that "we're a New Jersey company and there's tremendous community pride in that." There's also a bit of a headache. Beefsteak tomatoes—which can grow up to six inches in diameter and weigh a pound—are hard to find in bulk. They require enormous amounts of sun, and are ready for picking only at summer's end. Following a 102-year-old recipe isn't so easy either, it turns out. "Seemingly, soup is very straightforward," said Campbell's corporate archivist Sarah Rice, "but there are many, many different ways to make it." As Rice explained, even if you add all the specified ingredients, the taste of soup can vary according to which you mix together and when you add them to the pot. What's more, measurements and cooking times in 1915 weren't as precise as the ones the company uses today. The original recipe called for "a basket of tomatoes" (which is how much?) and cooking the soup "until it looks right" (which is how long?) Campbell's early 19th century production lines used copper cooking kettles—today it's stainless steel—which exerted its own particular influences on the product. These variables aside, the company is confident it's nailed the flavor, color and consistency of its original recipe—something a fortunate few will get to sample on their own. But with only 10,000 jars to be sold, the existing batch probably won't last long, and this begs the question: Will the company cook up another original batch sometime down the road? "Looking back at our roots has inspired us to look forward to the next 100 years," Morale said, "and we're thinking of how we can recreate this every year." The trick, of course, will be finding enough of those beefsteak tomatoes.